The tradition of handmade rugs dates back thousands of years. Each country of the world has its styles, colours, and designs which vary with one region to next region. The tradition of waving rugs is steeped in history and rugs are now considered an art form. Some people have been inspired to buy handmade rugs after seeing the beautiful classical look in museums. Some researchers have stated that handmade rugs pre-date the Egyptian pyramids. Some say that the first rugs were made several thousand years ago in the Central Asian Plains. They had even use rugs as surfaces for eating and for transporting goods. However, the pzyryk carpet is the world’s oldest handmade rugs. It can be seen in the Hermitage, St Petersburg. The archaeologists in Russia have discovered the carpet in the tomb of an ancient prince which is around date back to 5th century BC. The carpet colour is deep red and depicts horsemen and animals. Ardabil carpet is another example of a historical handmade carpet which is stored in the Victoria and Albert Museum, London. The making process starts with hand-spun wool. The reason behind of using hand-spun wools offer more shine and lustre. After selection of wool, its moves to the dyeing process. In the dyeing stage, all the wools are coloured with using natural dyes. Natural dyes are organic and offer great textures. Here the weaver describes the pattern to the designer. The designer then sketches out the design on a graph paper. After completion of the design, it goes for the approval, and it is sent to the loom to be created. The waver translates the graphed pattern onto the actual rug. After that, they wash it to get the right texture and look. The washing process of the carpet can take around 2 to 3 weeks. 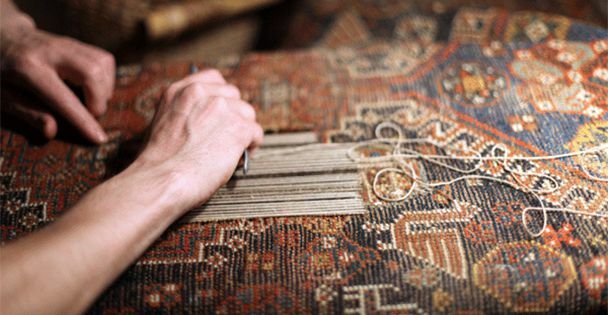 In the end, the handmade rugs go for final QA process to make sure that it is pure and clean and ready to enhance the beauty of the room. Modern rugs are quite beautiful as they are developed by keeping in mind the recent fashion. While choosing a handmade rug, one must consider various factors like the fibre with which the rug was knitted, the colour which should match with your home design, also the rug’s shape and size. Handmade rugs come in different shapes, such as round, square, triangular, octagonal and more. One can also customize the design as per their preferences. The colour of handmade rugs can greatly influence the brightness of the room. If you have seen a beautiful handmade rug in a museum and want to buy handmade rugs, try talking to a specialist about the styles. It’s time to decorate your home with fine and beautiful handmade rugs. Previous story Why You Should Buy Handmade Rugs Rather Than Machine-Made Products?